The whimsical story is accompanied by striking oil paintings. The two fish are portrayed in fluid orange and gold brushstrokes, while the bowl is a luminous sphere reflecting different colors from page to page. One of the final spreads depicts a homey breakfast table holding all of the everyday objects bestowed with magical qualities through the eyes of the fanciful goldfish. Amused children will protest as Paul falls under Bernadette’s spell... Lamb’s delectable painting technique recalls that of confection-master Wayne Thiebaud; her backdrops resemble buttercream frosting in turquoise, sky blue, and lichen green, and she limns the fishes’ domain with impasto brushstrokes of white, yellow, and marine blue. Her sly approach to the way that love and friendship can alter one’s very view of life welcomes repeat visits. A banana is a boat and a spoon’s a fish in this sequence of charming, painterly oil illustrations that study the dodgy perspectives of two goldfish in a bowl. ... [A] lovely, debatably romantic ode in oils. Fabulous... The watercolor illustrations are simply stunning. This book has numerous uses; it could easily be integrated into art or guidance lessons, or it could be used in a language arts lesson. Filled with bits of humor, this book will please students and teachers alike. The simply written story works well with the vibrant oil paintings. The well-defined painterly brushstrokes add another dimension of texture, direction, and motion to the scenes. Young children will enjoy correcting Bernadette’s misidentifications and creating their own as they engage with this imaginative picture book. 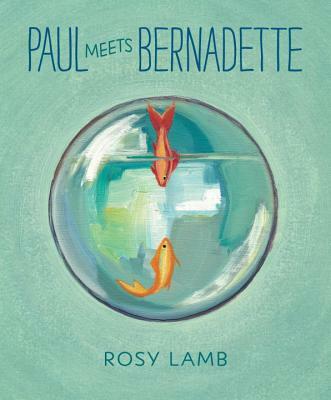 Gorgeous oil paintings and gentle humor combine in Rosy Lamb ’s “Paul Meets Bernadette,” a charming story about a goldfish, Paul, who gains fresh perspective when a companion “drops in” to his bowl. In an exquisite sequence, we see the fish, Paul, going around and around in his glass bowl... Everything changes, however, when Bernadette arrives (charmingly, she "drops in"). ... Children ages 3-8 will love that Bernadette thinks a nearby green alarm clock is a cactus and that she mistakes an elegant teapot for a mother elephant. ... This richly painted debut works as a cheery fable for children but also as a tender metaphor for older readers—not in the confusion of teapots but in the way that opening our eyes to beauty can determine whether our days are dull or fresh and full of color. The pictures are luscious and the story will challenge children to decide whether they agree with what Bernadette describes from her view within the bowl.